As we grow, we pick up habits that will never truly leave our memory, even if other parts of our memory fade away. Lucille, better known as ‘Ms. Bitsy,’ loves cooking, especially homemade pecan pies. This was one of her fondest memories of growing up in the south. Ms. Bitsy is 86 years old and living with dementia. She moved from her childhood home in sunny Daytona Beach to a farm in Tennessee with her daughter Mindy and son-in-law Bobby, and they took care her until Mindy unexpectedly passed away. Since then, Bobby has made it his mission to care for Ms. Bitsy, a promise he made to his wife, and makes sure she has everything she wants and needs. He has also hired BrightStar Care of Chattanooga to ensure she has the professional, quality care she deserves. To keep life exciting, Bobby enjoys surprising Ms. Bitsy in creative ways. 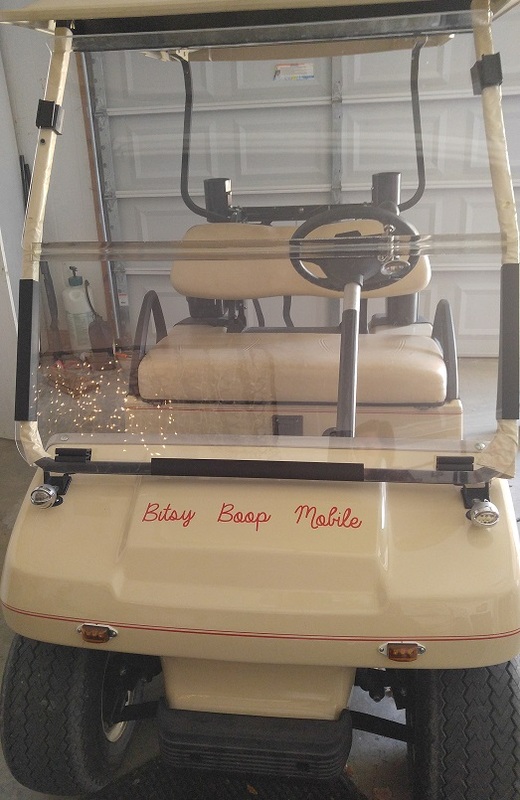 The most notable surprise was a customized golf cart that he labeled the “Bitsy Boop Mobile” in honor of her love for Betty Boop. She was thrilled! Angie, the community liaison and scheduler for BrightStar Care of Chattanooga, said, “That is what she calls her car. She likes to take long rides [with her BrightStar Care caregivers] and look at the beauty surrounding her. When at home, Ms. Bisty loves watching her horses. She talks to them. She will take pictures with her camera with some assistance.” Creating new memories like these gives her so much joy as older memories don’t come back as easily as they used to. Angie likes to work with Ms. Bitsy as much as she can. They have a special bond. “Bitsy used to be a wonderful cook until she became unable to because she forgets the stove is hot and forgets to turn it off. Now me and Bitsy will sit and prepare meals at the table,” says Angie. One day, Ms. Bitsy told Angie she wanted to surprise Bobby with a homemade pecan pie. This started a grand baking adventure for the two. Together, they followed a recipe with Angie prompting Ms. Bitsy step-by-step. The crust for the pie was prepared from scratch. 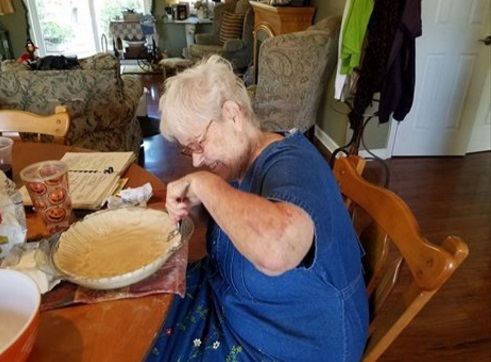 When the dough was sticking to the counter, Ms. Bitsy rolled up the dough into a ball, placed it into the pie dish and then began to shape it out. She loved scalloping the edges of the crust with a fork. The whole process took about an hour and a half to assemble the pie, but Ms. Bitsy enjoyed every minute of it!